I think it's time to devote a thread specifically to this week's SB. New England and Philadelphia, you say. Many thought it would end this way, prior to Wentz's season ending injury. What a shame! But you move on, and The Eagles made the most of it. Can they bring down the defending Champs? I hope so. - It will be interesting to see how Gronk is doing, but something about The Pats usually worries me, as in, they did pretty good without him. - Call me goofy, but I have a bit of a good feeling about this game. If Foles plays a decent game at all, and they utilize their run/pass combo with effectiveness, they can show off a lot of weapons. - Truth is, somewhere along the line, coaching will be a factor. I hope that The Eagles come loaded with confidence and no fear. That they trust what got them there, and not find themselves making mistakes that they have not made for most of the season. Like them or not, The Pats and BB can have that effect on some. - I have a hunch that Chris Long will make a dent this Sunday. He still has that motor, and he might just be the guy to get to Brady, and more than once. He's done about as much as a football player can do, and he is very much playing for others this season....this one would be a nice feather in his cap. 2. In the pick em I took the safe bet of the Pats. 3. Interesting to see the general public has teased the spread down to only 4 points. They were saying it was the most lopsided SB spread since '09 when the line opened. The fans have bet on Philly all week. 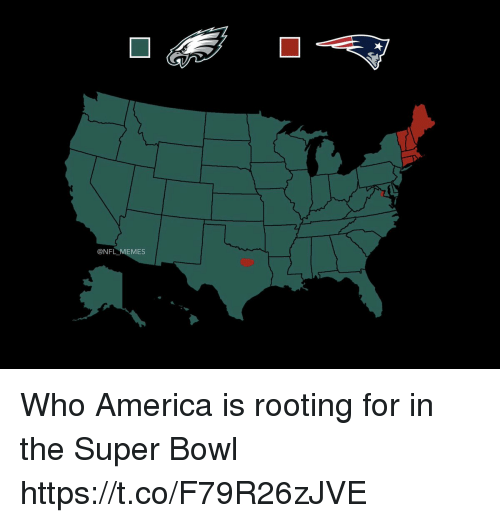 Maybe because Pats SB's always come down to a one score game but maybe they believe in the Eagles? 4. I saw an interesting stat that Foles and Wentz career stats with the Eagles are nearly identical across the board. Perhaps Foles is better than we give him credit for? Although I'd bet on The Pats if I was a betting person, I can see a really cool story come out of this. Eagles and Wentz look to be the team to beat.....Wentz goes down.....Foles comes in and initial team results do not look promising.....Eagles make it to The Dance....Foles and The Eagles beat The favoured Pats!!! Even though Foles was taking over for Wentz, I said all throughout the playoffs I liked them for the SB... and this weekend really like them as the winner. I know it's probably a bad bet, but I would put it on the underdog for this one. In theory, it would be great if the ground opened up on Sunday and swallowed the stadium with both teams inside. However, since that’s unlikely to happen, I’m still not sure what outcome I want most. The one problem with the comparison is that the Eagles don't have a John Elway or a Terrell Davis. And really it was more TD that carried us to the upset cuz Elway didn't have a great game. But from a leadership standpoint I don't think Foles is capable of it. Now from a defensive standpoint I could see the Eagles D surprising folks and wrecking the day similar to how ours set us up with a shocking start early in our SB upset. After all it was the D that kick started the massive momentum change last week against Minnesota. I remember that vividly-- we were 13.5 pt underdogs! In fairness to Vegas the NFC had won 13 straight Super Bowls and many of them were uncompetitive. And we had a history of being uncompetitive in the Super Bowl. After Favre led that opening TD drive my whole family was saying "Crap here we go again"
true, i remember Broncos made it to the SB multiple times and didn't get the ring ... had forgotten about the NFC side of it. I predict that if Philly builds a huge lead...they will run the ball. Rooting map looks spot on. I thought Vegas sets the odds mathematically and statistically, not based on previous SB history? The Packers were fielding a statistically great team then, on every side of the ball. I had a strong feeling we were going to win though. After watching an undefeated and seemingly invincible Packers team fall to a winless Colts team (the worst in the League then) during the '97 regular season, I saw a chink in their armor and mustered hope that the Any Given Sunday Rule could apply despite odds and statistics. I am officially getting excited about seeing The Eagles win The SB tomorrow! I repeat, I have a good feeling about the game, and I feel like Chris Long is going to be a factor.